Best of The West | MMA Fighting Events Videos Techniques UFC Fight Picks and News. able to pull off all the last minute manuevering. While there's no chingasos in submission grappling, there is still a lot of hand to hand combat action. We call it "chinga-jitsu". While the adults we're really putting in work going after submissions, it was also fun watching the kids work their submission grappling game. They set it off, shooting for takedowns, going for triangles, and reversing opponents. Enjoy the pictures from Sunday's Best of the West. 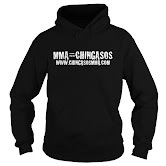 They're on our Facebook Chingaso MMA Fan Page.